Brand e.g. Wippermann – Chain No. 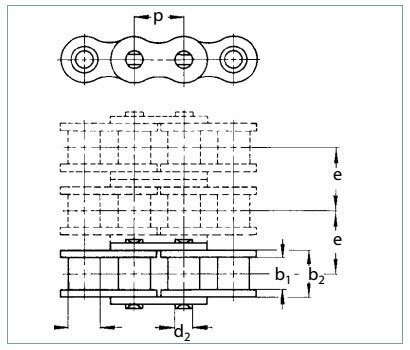 Please state, if simplex, duplex or multiplex chain designs are required.For replacement chains it is sufficient to state the main dimensions p, b1 andd2 as well as e for multiplex chains. If a chain is to be extended or repaired, all the dimensions shown in the drawing must be supplied. What will the chain be used for? Please inform us on the application area of the chain. 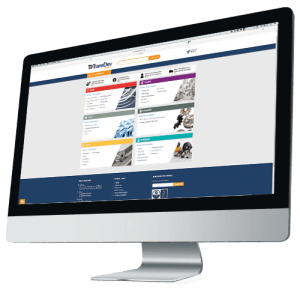 We will then be able to offer you the perfect chain for the application you have in mind – and you will benefit from our extensive experience! Chains envisaged for parallel running operation are matched for length, pre-stretched and marked at extra cost. It is important to clearly stipulate this requirement when ordering! In special cases measured chains can be supplied at extra cost. (e.g. A, B, C, D, E or F); for other special designs please state if single-sided or double sided attachments are required. In (preferably even) multiples of pitch p. If attachments are also available on the inner link, the attachment spacing can be arranged in any way. In case of an odd number (e.g. T = 3p) the attachment is alternated on the outer and inner rings. If inner link attachments are not available, an odd number spacing can only be made possible by mounting a cranked connecting link No. 12, or a double cranked link No. 15. In this case the chain may only have 80% of the breaking load! a) When ordered by length in metres, the end links are always inner links. Connecting links must be ordered separately! b)When ordered by a certain number of links, this number should be divisible by the distance T of the special links (e.g. chain length 176 links, T = 4p, i.e. 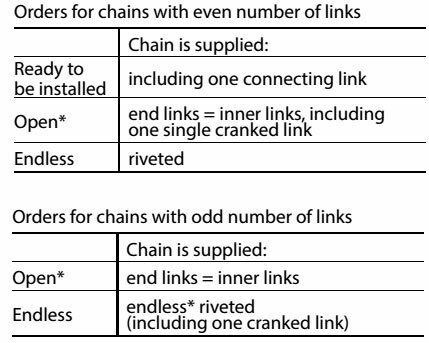 every 4th link is a special link; the chain includes 176:4 = 44 special links). If the chain length cannot be a multiple of T, but has to be longer or shorter for design reasons, this fact must be clearly stated as: “Does not work out even!” In such a case the distance T at the end of the chain will be alternately longer or shorter. Chains with an even number of links will be delivered with a connecting link and are ready for assembly. With a distance of T = 2p (each outer link is a special link), the connecting link is supplied in the respective special design. With a distance of T = 4p and more the connecting link will be supplied in the standard design. *When cranked links are used, roller chains may only have 80% of the breaking load. Avoid if possible!